We invite you to learn how to choose and prepare food that supports your commitment to a compassionate world. This way of eating cares well for the planet, for our fellow animals, and for our health. Plant-Powered Earth Holders (PPEH) are members of the Earth Holder Sangha who offer support to those who wish to explore, and perhaps move toward, a compassionate, more plant-centered diet. We hope these recipes, nutrition guides, and other resources help you in this important journey. Thanks to our wonderful, growing Plant-Powered Earth Holder sangha, we now have the Compassionate Eating Mindfulness Training offered by our Brother Phap Ho in English/Spanish, French, and German! Now, we need a wonderful Vietnamese speaking friend to help us with translation of it! Welcome to 2019 the Year of the VEGAN! The Economist and Forbes both called 2019 the year plant-based eating goes mainstream!. This is good news for people, animals, plants, and minerals–and the planet! And, turns out, good for business too!! 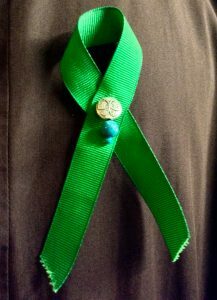 You can join in and join us at our next Plant-powered Earth Holder Sangha gathering on Jan. 21st. 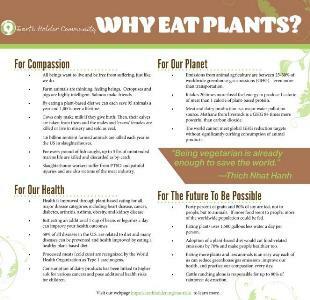 Enjoy our new WHY EAT PLANTS Poster. The Plant-Powered Earth Holder Team invites you to take the vows of compassionate eating below. This is a concrete way of supporting your health and the earth. You can see our new brochure Why Eat Plants PPEH Brochure to learn more. To reflect on the new Mindfulness Training about edible foods regularly. To look deeply into the source of my food and learn new ways to prepare plant-based food and practice compassion in my diet. To shift to a plant-based diet, with the intention to work up to 15 days a month as Thay has encouraged us. VIDEO-–Meet the Plant Powered Earth Holder Team! We’d like to introduce ourselves so you can know more about us and why we are Plant-Based. We’d love to hear from you!! Meet the Plant-Powered Earth Holder Team. We know you are there and we are very happy. PPEH Fact Sheet: Milk, Dairy, and Meat Substitutes If you are looking for ways to replace animal foods in your diet, then this fact sheet is for you. The Plant-powered Earth Holder team tries to share some encouraging information each month. Here are a couple sample Updates. REPORT: How to Encourage Local Governments to address Plant-Based Diets in Climate Planning. MEAT OF THE MATTER: A Municipal Guide to Climate-Friendly Food Purchasing, by Friends of the Earth and the Responsible Purchasing Network. The report outlines the issues and a process for addressing climate impacts in the climate planning process. It notes that, although significant actions are being taken to address climate change, one critically important sector that accounts for about one fourth of global greenhouse gas emissions is not being addressed: food. A wealth of scientific research underscores the urgency of substantially reducing meat and dairy consumption, which accounts for more than half of all food-related GHG emissions. It is clear that the world cannot meet global greenhouse gas reduction targets without curbing consumption of animal products. New Video: Enjoy Making (and Eating) Prune Truffles. Recipe from our own Plant-powered Earthholder Eve Heidtmann is here! Video is here. Click here to Enjoy this fantastic Kale Salad! and here is the recipe. We are so happy to offer this recipe from our own Aurora Leon- physician, plant-powered Earth Holder, distance runner, and all-around amazing athlete! This recipe is simple and will make sure you get your day, and year, off to a good start! Steel Cut Oats to Start your day and New Year! Article: Now Your Dog can be Safely Plant-Based too! One question that came up on a PPEH Webinar was a question about diets for our pets. It turns out that cats are carnivores but dogs can safely eat a plant-based diet. http://www.latimes.com/opinion/op-ed/la-oe-dawn-dogs-vegetarian-20171227-story.html. A dog has nutritional requirements, but not ingredient requirements for a healthy diet. Fact-Sheet: Check out our newest Plant-based Fact Sheet Cashews-the Key to Creaminess! All you need to know about the worlds favorite food! Our Go-To Source of Recipes is THE JOY OF MINDFUL COOKING This project is an amazing offering of love for community and the planet. You can find many, practioner-tested recipes here. If giving up cheese is your challenge, try our Fact Sheet on plant-based cheeze! CHEEZE PLEEZE! 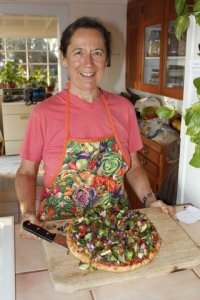 Ask a Plant-Powered Cook – Have questions about plant centered ingredients, recipe modification, shopping sources, cooking new plant foods, and ways to have a plant-based lifestyle in a culture that is focused on eating meat and dairy? Ask Marge or Eve who have been cooking and eating a plant-based diet for decades. They love to help others trying to move in that direction. Earth Holder members may e-mail them for answers to questions at ppeh.cook@gmail.com. Members living in the continental United States can also email to set up a phone call. Nutrition video: The Myths of Protein – Learn why our bodies need protein and other nutrients, how much protein is enough, and the best sources in this video from Plant-Powered Earth Holder member Dr. Joaquin Carral. Protein in vegetables and grains – Spinach is 50% protein, more than salmon! Ask a Plant-Powered Doc – Have questions about plant-based diets and health? 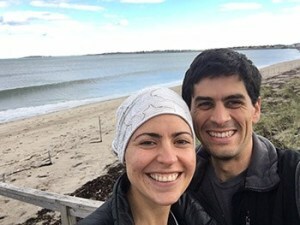 Ask Aurora and Joaquin, who are both plant-based physicians. They work in primary care and have helped many of their patients switch to a plant-based diet. With this change they have witnessed great improvements in their patients with diabetes, cholesterol, hypertension and pain, among many other health issues. Earth Holder members may e-mail them at ppeh.doc@gmail.com. Diet impact calculator – How many animals and Earth resources can you save by eating plants for a day, a week, or more? You can also save money and eat economically with a plant based diet. Lay communities should be courageous and give rise to the commitment to be vegetarian, at least 15 days each month. If we can do that, we will feel a sense of well-being. We will have peace, joy, and happiness right from the moment we make this vow and commitment. We only need to be vegetarian, and we can already save the earth. Being vegetarian here also means that we do not consume dairy and egg products, because they are products of the meat industry. If we stop consuming, they will stop producing. Only collective awakening can create enough determination for action.As a spiritual family and a human family, we can all help avert climate change with the practice of mindful eating. Going vegetarian may be the most effective way to stop climate change.Being vegetarian is already enough to save the world.